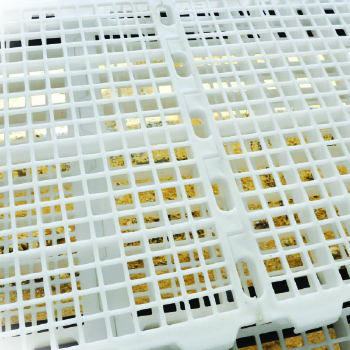 Warm, dry and comfortable, GSI’s Poultry Flooring is made from high-impact, wear resistant polypropylene plastic designed to replace wood or wire slats in poultry housing. Our Slatted floor reduces foot pad related disease and breast blisters often experienced with wooden slats and will easily outlast them. 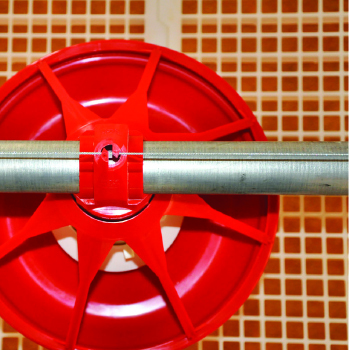 Our solid plastic construction is rot/corrosion proof, resists microorganisms’ build-up and sheds waste efficiently. Made from high impact polypropylene plastic material for durability & easy cleaning. Corrosive free does not hide contaminants or harbor bacterial growth. Available with or without UV protection. Designed with interlock system for all four sides of the slat. Provides secure attachment to the steel support beam. Strong enough to hold 120kg (265lbs) of body weight to stand or walk. PVC slat support or fiberglass pultrusion cross bar and available for complete slat system package.